Roach's Mill Camp, Va., August 4, 1861. Pursuant to the orders of Colonel Miles, the brigade advanced from the camp and took their assigned position on the heights east of Centreville about daybreak: The Eighth Regiment New York State Volunteer, commanded by Lieutenant-Colonel Stahel, on the left of the road leading from Centreville to Fairfax Court-House; the Twenty-ninth Regiment New York State Volunteers, commanded by Colonel Steinwehr, on the right of the same road, both fronting towards the east; the Garibaldi Guard, commanded by Colonel Utassy, formed a right angle with the Twenty-ninth Regiment, fronting to the south. The artillery attached to the brigade occupied the following positions: The battery of Captain Tidball stood in front of the left wing of the Garibaldi Guard; three pieces left in Centreville were placed near the right wing of the Twenty-ninth Regiment; three others on the left wing of the Eighth Regiment, where intrenchments were thrown up by the pioneers attached to the brigade. The last-named six pieces were served by experienced artillerists detached from the Twenty-ninth and Eighth Regiments. The Twenty-seventh Regiment Pennsylvania Volunteers, Colonel Einstein, was detached to the village of Centreville for the protection of the headquarters and hospital. Four companies of the Twenty-ninth Regiment were detached in front of our position towards the road from Union Mills, to prevent the enemy from outflanking, unobserved, the left wing of the Army. During this time I received the order to disarm one company of the Twelfth Regiment, which was promptly executed by two companies of the Eighth Regiment New York State Volunteers. 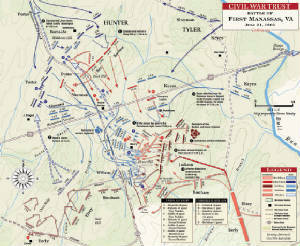 In this position the brigade remained until about 4 o'clock p.m., when I received orders to advance upon the road from Centreville to Warrenton. This order was executed with great difficulty, as the road was nearly choked up by the retreating baggage wagons of several divisions, and by the vast numbers of flying soldiers belonging to various regiments. Nevertheless, owing to the coolness of the commanding officers and the good discipline of the men, the passage through the village was successfully executed and the further advance made with the utmost precision, and I was thus enabled to take a position which would prevent the advance of the enemy and protect the retreat of the Army. 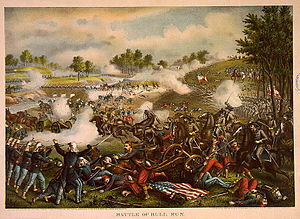 The Eighth Regiment took position one and a half miles south of Centreville, on both sides of the road leading to Bull Run. The Twenty-ninth Regiment stood half a mile behind the Eighth, en echiquier by companies. The Garibaldi Guard stood as reserve in line behind the Twenty-ninth Regiment. The retreat of great numbers of flying soldiers continued till 9 o'clock in the evening, the great majority in wild confusion, but few in collected bodies. Soon afterwards several squadrons of the enemy's cavalry advanced along the road and appeared before the outposts. They were challenged by "Who comes there?" and remaining without any answer, I being just present at the outposts, called, "Union forever? Whereupon the officer of the enemy's cavalry commanded, "En avant; en avant. Knock him down." Now the skirmishers fired, when the enemy turned around, leaving several killed and wounded on the spot. About nine prisoners, who were already in their hands, were liberated by this action. Afterwards we were several times molested from various sides by the enemy's cavalry. At about midnight the command to leave the position and march to Washington was given by General McDowell. The brigade retired in perfect order, and ready to repel any attack on the road from Centreville to Fairfax Court-House, Annandale to Washington. Besides the six guns which were mounted by our men, and thereby preserved to our Army, the Eighth Regiment brought in safety two Union colors left behind by soldiers on the field of battle. The officers and men did their duty admirably, and the undersigned commander deems it his duty to express herewith officially his entire satisfaction with the con-duet of his brigade. The three regiments (the Eighth, Twenty-ninth, and Garibaldi Guard) arrived in Washington in good order at 6 o'clock last night, after a fatiguing march of nineteen hours. The loss of the brigade amounts to fifteen or twenty killed and wounded at the 'outposts. Thus far my report of the action taken by my brigade in the engagement on the unfortunate day at Bull Run in a military point of view. It was my intention, although there were in some instances prominent features of action on the part of officers and men, to defer a final report of these facts for a better and more suitable opportunity, on account of the very unfortunate result of the battle. I have read since so many reports in newspapers, where many a high commanding officer pretends to have been in the very rear with his brigade or regiment at the retreat, that I am obliged to repeat in the most absolute terms that, according to my order, all regiments, artillery, and stragglers had passed my arrière guard at Centreville and the last artillery at Fairfax Court-House, and that the brigade under my command not until order was received by General McDowell marched across Long Bridge into Washington.